Freeman Technology, the powder characterisation specialists, will be hosting a ‘Powder Flow Seminar’ on the 8th May 2019 at the Hyatt Place Frankfurt Airport Hotel, Germany. The free one-day event will introduce delegates to the benefits of powder rheology. In his latest instalment, ‘Exploring the Impact of Particle Size on Bulk Powder Properties’, one of the most widely recognised variables affecting powder flow properties, particle size, is reviewed. Powder flow specialists Freeman Technology will be exhibiting at Ceramics Expo on booth 137 (April 30 – May 1 2019, Cleveland, OH, USA). The company offers material characterisation solutions aimed at optimising process performance. Freeman Technology, the powder characterisation specialists, will be hosting a ‘Powder Flow Seminar’ on the 8 May 2019 at the Hyatt Place Frankfurt Airport Hotel, Germany. The free one-day event will introduce delegates to the benefits of powder rheology. Over the 20 years that Freeman Technology has been working with powders significant advances have been made in powder testing technology and in the efficiency of powder processing. These advances come from a more developed and secure understanding of powders. Powder flow specialists Freeman Technology will be exhibiting at Ceramics Expo (April 30 – May 1 2019, Cleveland, OH, USA). The company offers material characterization solutions aimed at optimizing process performance, increasing productivity and improving quality. In a new online presentation Tim Freeman, Managing Director, Freeman Technology, introduces uniaxial powder testing; explaining the measurement methodology and presenting example data. The FT4 Powder Rheometer® was designed with one purpose in mind - to characterise the rheology, or flow properties, of powders. The instrument, accessories and methodologies have been continuously developed to the point where the FT4 is considered a universal powder tester. Join Freeman Technology at Interphex Japan 2019. Join Freeman Technology on booth 131. Join Freeman Technology and Micromeritics on booth N1A19. The Uniaxial Powder Tester (UPT) ranks powder flowability via the same metric as a shear cell tester, but uses a simpler, faster, more direct technique, and requires a lower investment. It is an excellent alternative to traditional powder testers. In this thought leadership piece, Todd Mollner, Global Product Owner – Respiratory Powders, GlaxoSmithKline (GSK), tells European Pharmaceutical Manufacturer about the important of powder testing in pharmaceutical manufacturing. 3D MicroPrint GmbH (Chemnitz, Germany), a company pioneering the use of Additive Manufacturing (AM) to produce complex, micro-scale metal parts, is using the FT4 Powder Rheometer® to identify ultra-fine powders that will process efficiently. In a recent interview with AZo Materials, Andrew Klein, Director of Research and Development at ExOne, discusses the importance of powder flow in 3D printing. Powder flow specialists Freeman Technology, will be exhibiting at Powtech in Hall 4 Stand 547 (9-10 April 2019, Nuremberg, Germany). Now part of the Micromeritics Instrument Corporation, the company will be showcasing their material characterisation solutions. Understanding Powder Behavior in Food, Pharma and Chemical Industries’ will hear leaders in the field discuss the industrial applications of powder rheology. Powder flow specialists, Freeman Technology will be co-hosting a free seminar with Evonik Corporation on February 27th 2019 at Evonik’s facility in Piscataway, NJ. In our latest newsletter we’re putting the spotlight on the powder testing solutions added to our offering in the last couple of years that directly complement the FT4 Powder Rheometer®. Visit the Freeman Technology team on booth 353. See the FT4 Powder Rheometer on booth M5-M14. See the FT4 Powder Rheometer on Micromeritics stand 424. The innovative offline Consolidation Station provides users with additional testing capabilities. It allows powder samples to be subjected to a range of environmental conditions. Visit the Freeman Technology team on booth 137. Join the Freeman Technology team on stand 4-547. Our latest whitepaper, featured in Pharmaceutical Technology, demonstrates the value of dynamic powder flow measurements for the development and optimisation of wet granulation processes, drawing on data from two experimental studies. Powder flow specialists, Freeman Technology will continue their ‘Powder Flow Seminar’ series on October 3rd 2018 at LPW Technology’s facility in Imperial, PA. The free one-day event will hear leaders in the field discuss the applications of powder rheology in AM. Freeman Technology is pleased to announce the release of ‘The Influence of Storage and Handling’. When working with powders, in-process performance and final product quality will be influenced by properties of the raw materials delivered to the process. Freeman Technology, the powder characterisation specialists, will be hosting a ‘Powder Flow Seminar’ on the 12th September 2018 at the Akzent Hotel Franziskaner in Dettelbach, Germany. The free one-day event will introduce delegates to the benefits of powder rheology. Fresh onto our YouTube channel are translated versions of the popular ‘Introduction to Powders’ and ‘Uniaxial Powder Testing’ animations. We’re delighted to extend their accessibility with versions now available in Italian, German and Japanese. 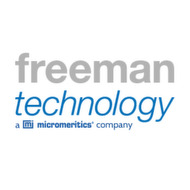 Micromeritics Instrument Corporation, a leading global manufacturer of premium products for advanced material characterisation, today announced the acquisition of Freeman Technology.